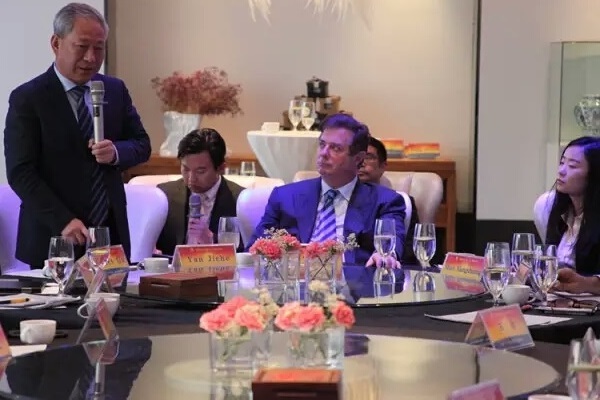 Paul Manafort meets with Yan Jiehe, March 5 (China Pacific Construction Group; archive). Former Donald Trump campaign manager Paul Manafort, currently under investigation for his pro-Russian ties and Russian money laundering, will now be advising Chinese billionaire Yan Jiehe (严介和) on gaining access to lucrative infrastructure projects in the United States according to the Financial Times. Yan is the founder of China Pacific Construction Group (CPCG, 中国太平洋建设集团) and one of the wealthiest men in China (See also Fortune, Huffington Post, Salon, The Week). Manafort met with Yan in Shanghai on April 11, according to the Financial Times, and was described by Yan as “Trump’s special envoy.” During his visit Manafort was treated to a Huangpu riverboat tour of Shanghai, and indicated that he “would be returning to China within a month for further talks.” Yan clearly indicated that the purpose of the meeting was to discuss access to U.S. infrastructure projects to be funded by the Trump administration to the tune of a trillion dollars. “I will not seek out Trump,” said Yan confidently, “He will seek me out. In the entire world, I am definitely the most ideal privately owned unit to invest in construction. In the whole world, there’s not another company equal to Pacific Construction.” Despite such bravado, Yan’s meeting with Manafort suggests that he is indeed seeking out Trump (and seeking out U.S. public funds that American taxpayers might rather see go to an American construction company). Manafort’s spokesman, Jason Maloni, initially denied that Manafort was in China on business; then denied that his business in China involved “any current or future infrastructure projects or contracts in the United States.” Maloni’s denials seem to conflict with Yan’s own statements at this meeting, however, and with the details of previous contacts between Manafort and Yan. According to the CPCG website (March 8; archive), Manafort met previously with Yan in Beijing on March 5-7. Manafort and Yan are pictured above at this meeting and below with unspecified others in attendance. The meeting is reported in detail also by Jingsun Group (京商集团, March 15; archive), an infrastructure company associated with Yan that hosted the event. This previous meeting is not included in the Financial Times report, and until now seems to have escaped U.S. media attention. 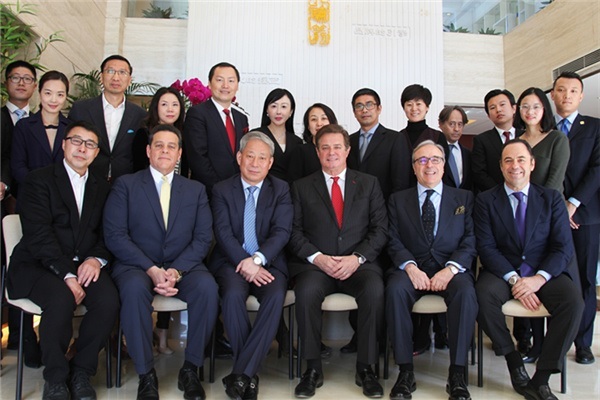 Paul Manafort in Beijing, March 7 (China Pacific Construction Group; archive). In Beijing, as in Shanghai, Manafort was described as a “special envoy of President Trump” (He was also curiously described as the “godfather of Ivanka Trump.”). 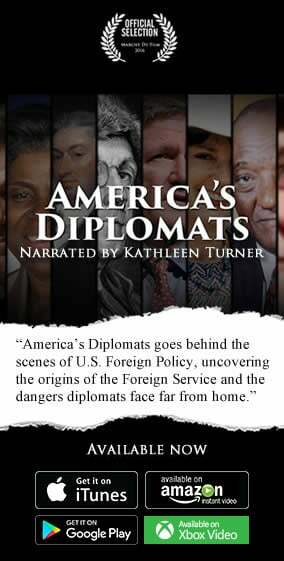 Manafort is praised in these reports for his work on behalf of such figures as former dictators Ferdinand Marcos of the Philippines, Mohamed Siad Barre of Somalia, and Viktor Yanukovych of Ukraine. Manafort’s history with these and other autocrats around the world appears to have been taken as a prime qualification for work on behalf of China’s interests. Yan has a reputation as something of a maverick and claims to keep a distance from the Chinese Communist Party. He is a former local government official, however, and frequently appears alongside current party officials on Chinese government and state-run media websites. No one does business in China as successfully as Yan without having a cozy relationship with the Communist Party. 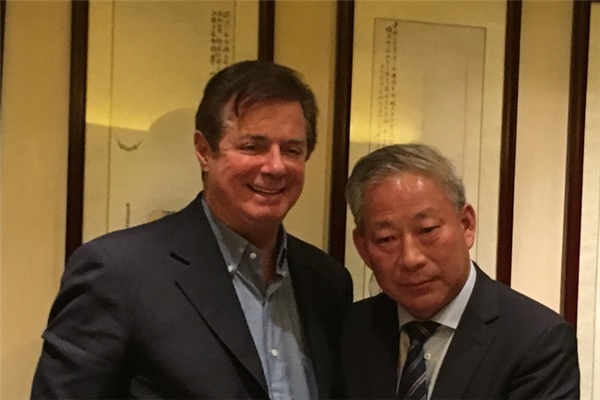 Yan Jiehe with Paul Manafort, Beijing, March 6 (Jingsun Group; archive). In comments to Fortune, Yan said that a total of three meetings with Manafort in China have taken place.